Hey! all work no play is not cool, right? We work hard but at the same time we play smart too, after all life is all about experiences. And it’s good to reward ourselves after a long day work. 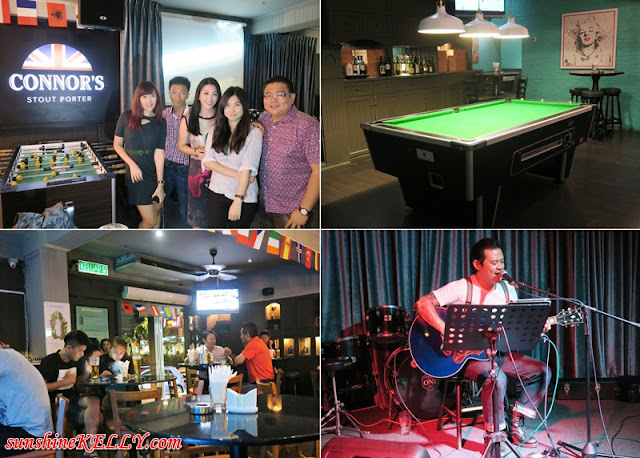 Here we go… recently I had a wonderful chill out night at Chapter One Bar & Bistro, Desa Sri Hartamas with some friends over good food and drinks; pints of CONNOR’S Stout Porter. It was A Night Made Right from the moment I left my office, to the venue and till I reached home. So here is my first CONNOR’S Experience. Well nowadays it’s wiser to take GRAB whenever we go to the city or night out drinking with friends. There is no stress when we stuck in the traffic jam, no hassle to search for parking in the malls, suffer the expensive parking rate and if we drinks there is no risk at all during road block. All we want is a stress free life. So after work I decided to book the GRABCar to Chapter One Bar & Bistro in Desa Sri Hartamas. Just on my Grab App and key in the location. Within 10 minutes I manage to get a driver, no hassle at all. The driver then called me to verify and then around 10 minutes he was waiting in front of my office. Yeah! Ready to go! I got a decent, clean, well-maintain car and the driver is courteous. There is no stench, bad smell and air-condition is working fine. I am glad I took the GrabCar because during the ride there were a bit of jam out from Shah Alam to the highway so I can relax, check my social media and reply email. Finally reached my destination, Chapter One Bar & Bistro at Desa Sri Hartamas safely and on time, so let’s have a good time yo! Upon arriving at the venue, we were welcome and served with pints of CONNOR’S Stout Porter and started to mingle around while waiting for the rest to arrive. The first sip is always memorable… the smooth and crisp texture, creamy head and dense foam. Then followed by gentle roasty undertones and well balanced taste as we continue to drink. The right hint of bitterness, robustness, flavour and aroma of CONNOR’S Stout Porter is truly pleasurable. I feel relaxed, enjoyed the moments and conversation with friends before the dinner. Connor’s Stout Porter is inspired by the original British Stout Porter recipe from the 1700s Great Britain. Back in the early 1700s, commerce was thriving as a result of Great Britain’s growing empire. Men at the docks, the porters, they kept things going. They thrived on honest work. Their reward at the end of a long day was simply having a good time with friends and pints of Stout Porter. Initially the choice of porters, but Stout Porter became popular among socialites and the upper class Brits when they discovered its unique balanced character. Not too rich, not too bitter, it was the only brew that was just made right. Approachable in its taste, Connor’s Stout Porter is a pleasure that’s easy to drink. You don’t need to be larger than life or jump through hoops to enjoy it. No fluff. No drama. No pretence. It’s just a great brew for good times with friends anytime. Indulge in a taste that’s… Just Made Right! This is a must order appetizer or can be as your finger food to kick start the conversation. Its Japanese-style fried chicken marinated with CONNOR’S Stout Porter for 8 hours meat marination and served with sweet, spicy and mildly bitter dipping sauce. The Chicken Karaage is cut into bite sized, flavourful and marinated with CONNOR’S Stout Porter for 1 day. It’s crispy on the outside and still juicy inside. Do eat it when it’s served hot then sip your CONNOR’S Stout Porter. You will crave for more, I don’t mind another serving. This is not any ordinary BBQ chicken. The chicken thigh is marinated with CONNOR'S Stout Porter for 8 hours, basted with with CONNOR’S-infused BBQ sauce, served with roasted potatoes and spicy vinaigrette on the side. The chicken meat is juicy, tender and flavourful with a hint of CONNOR’S Stout Porter especially on the skin. When paired with CONNOR'S Stout Porter it will tickle your taste bud, I can finish the whole chicken thigh. Enjoy the BBQ Chicken Thigh with 1 full pint of CONNOR'S Stout Porter at only RM40++. I wish that Chapter One can use the same recipe for chicken wings as well. I love BBQ chicken wings with my CONNOR’S Stout Porter. It might be a bit messy to eat chicken wing in the bar but it’s truly satisfying. Here comes the dish that we are waiting for… CONNOR’S Rib Slab marinated with CONNOR’S Stout Porter for 48 hours. Yes, I am not kidding Mr. Ernest the owner of Chapter One Bar & Bistro told us that their rack ribs are all marinated with CONNOR’S Stout Porter for 48 hours and then basted with CONNOR’S-infused BBQ sauce. We can’t wait to dig in! What I like about the CONNOR’S Rib Slab is that it’s not overly coated with sauce. The marination and sauce are just right, not to heavy or over flavourful. The meat is juicy, tender and the soft ribs bones. It’s best with a generous squeeze of lime on the rib slab. You get the rich BBQ flavours and aroma with zesty hint of lime. CONNOR’S Rib Slab comes with 2 full pints of CONNOR'S Stout Porter. The portion is good for sharing for 2 to 3 pax. This is for the steak lovers, have you tried Rib Eye grilled to your liking with special CONNOR’S-infused sauce? This is an affordable Rib Eye Steak served with special CONNOR’S-infused BBQ sauce, mashed potato and a refreshing pear and spring onion salad dressed in a lemon ginger dressing. The Rib Eye Steak is affordable because it comes with 1 full pint of CONNOR'S Stout Porter as well. I kind of like the socialable and relaxing atmosphere and the overall continental décor at Chapter One Bar & Bistro. It’s a perfect hangout spot for after work happy hours, weekend night out with friends, family brunch and events as well. It has a pool and foosball table too for those who want to unwind and have a bit of games. Plus I love live band and they have 6 days a week. A wide screen is also available to project live sports events. Overall all the dishes that were served at Chapter One on that night were infused or marinated with CONNOR’S Stout Porter and drank a few pints of CONNOR’S because it go so well with the food. Will definitely go back for more CONNOR’S BBQ Chicken, Rib Slab and perhaps by that time they might have the BBQ Chicken Wings too. After all the fun, dinner and drinks I got to excuse myself and make a move. I am glad that I took GrabCar to and from that day, I don’t have to worry or limit my drink. I drank quite a lot that night and it’s over the quota. I booked my GrabCar and got a driver with 5 minutes and I arrived home safely after 30 minutes. As you can see, what are we experiencing throughout the whole night is The CONNOR’S Experience. This is a holistic experience for us to fully immerse ourselve in the “Just Made Right” essence of CONNOR’S Stout Porter. From drinks to food to getting home safely after a fun night out, CONNOR’S Stout Porter wants to give us a chance to enjoy A Night Made Right with our buddies all packaged in one amazing deal. With The CONNOR’S Experience, we get to enjoy delicious CONNOR’S-infused dishes paired perfectly with a pint of CONNOR’S Stout Porter at great prices. CONNOR’S Stout Porter also embrace “Drink Responsibly” mantra through partnership with Grab; whereby we can enjoy free ride to and from each participating outlet. All this together, creates The CONNOR’S Experience. GRAB (formerly known as MyTeksi) will be offering a discount for all who take the ride with Grab either via Budget Taxi or GrabCar to the participating outlets. This exclusive discount from Grab will be RM8 off for 4 rides to the participating outlets for customers that pay via credit/debit card only. Use the promo code GRABCONNORS to enjoy the exclusive discount. Grab customers that ride with Grab to the participating outlets, you are entitled for a FREE Half Pint of CONNOR’S Stout Porter. You just need to flash your booking receipt to enjoy this reward. Each booking receipt is entitled for 1 FREE Half Pint of CONNOR’S Stout Porter. This is what you call 'in style'. Good food , great ambience and awesome company. Great way to chillex! Great to hang out and chill. I never tried Grabcar before, maybe will try soon. i love the idea of serving ribs on the banana leaf. so special! indeed quite a good stout experience. will definitely check it out! Aww~ they look nice and I love your top. What a good life this is. I'd like a similar experience that has nothing to do with alcohol since I don't drink it. your food picture make me hungry!! !The food really looks yummy!! that rib slab looks really good! food definitely looks appetising! the foods look delicious and appetizing! yummmm... might give it a try someday!